“to perpetuate the memory of our shipmates who gave their lives in the pursuit of their duties while serving their country. That their dedication, deeds and supreme sacrifice be a constant source of motivation toward greater accomplishments. Pledge loyalty and patriotism to the United States of America and its Constitution. But SubVets is much more. It is an opportunity to have camaraderie with others who share the distinguished trait of having qualified and served aboard United States submarines. 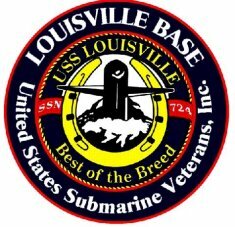 If you would be interested in joining or learning more about SubVets, then please visit our site at http://www.ussvi.org/base/Louisville.asp.